28 pin "leaf spring" socket, also known as a "dual wipe" socket. This works similar to a 28 pin machined socket except that it allows a chip or emulation cable to insert and remove more easily. 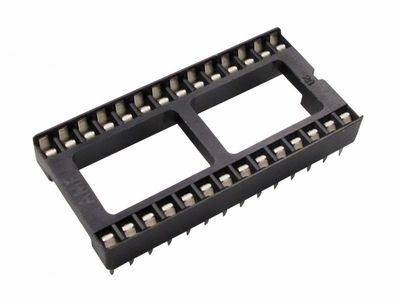 This leaf spring socket is an excellent option for connecting a Moates Ostrich ribbon cable into an ECU that has a ZIF socket.